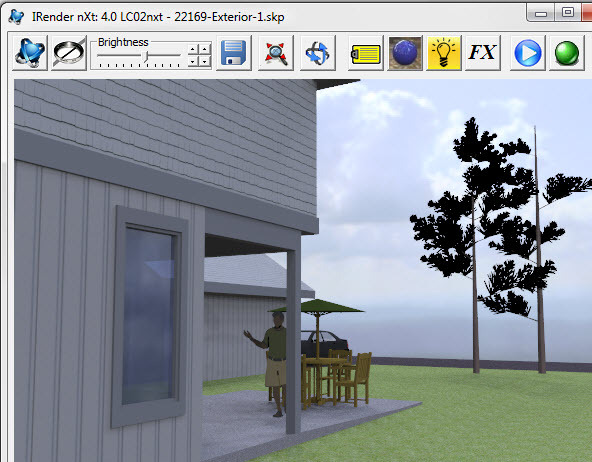 HDRi Skies will improve your SketchUp Rendering with realistic backgrounds and exterior illumination. This HDRi Sky Tutorial will guide you through a simple exterior rendering using an HDRi Sky for a background. After downloading the .ZIP file, click on the file name inside to install IRender nXt. 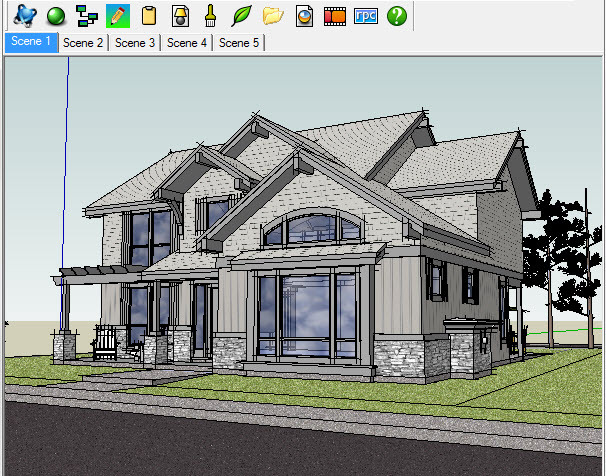 During installation, select the proper version of SketchUp if you have more than one version installed. 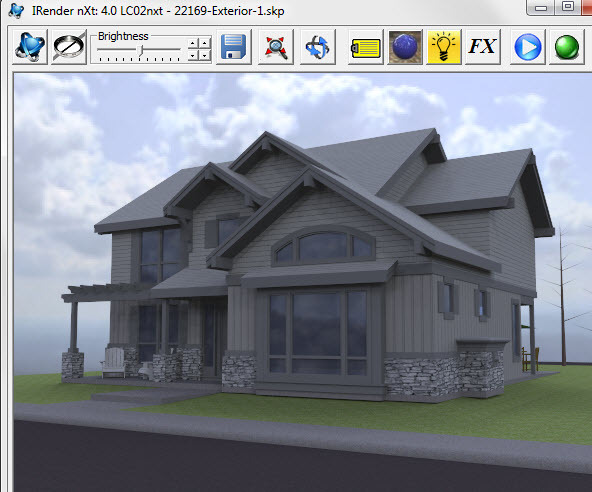 Select IRender nXt Load from the SketchUp Plugins menu. For your first rendering we suggest a simple exterior. 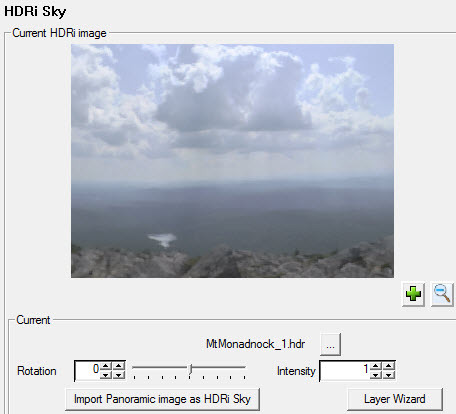 We are going to render it, using default HDRi Sky settings, without making any changes to the model. This will let you see the effects of the default lighting of IRender nXt. For exteriors, this is easiest to see if the model has roof overhangs, porches, or other features which will benefit from subtle lighting effects. I kept the same view, et. from the model after it downloaded. After you click the start rendering icon, the Rendering Settings dialog will appear to help you with your settings. Click Start Rendering to render your first image. Notice the reflection in the windows from the Sky behind us. 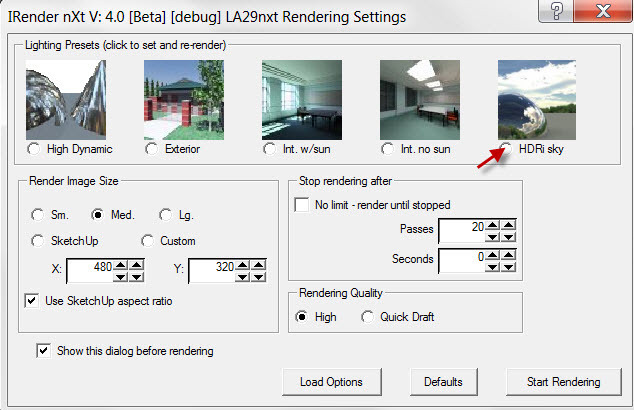 IRender nXt applies an automatic exposure control to set the brightness of the rendered image. If it is too bright, or too dark, use the brightness slider to adjust it. Here I increased the brightness using the slider to make a brighter image. Rendered image with brightness increased. Use the brightness slider at the upper left of the window. This 3D Warehouse model uses edge lines for its trees. These are not normally rendered and the trees look barren. 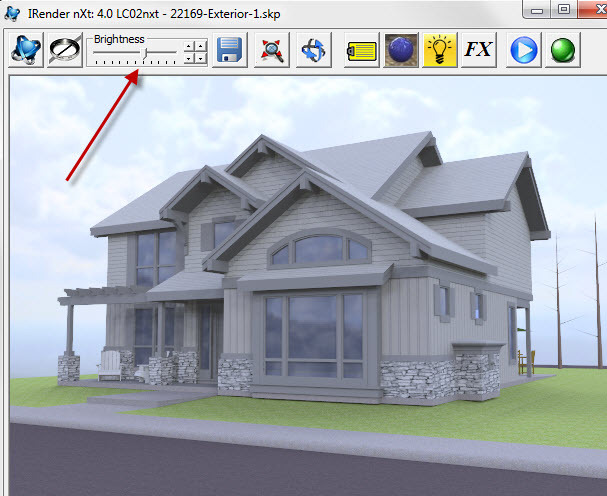 There is an option in IRender nXt to render the Edge Lines if you have models which use edge lines for detail. Also you could replace the trees with RpTreeMaker trees which always render with full detail. Rendering of Side of House with Edge Lines to see Tree Detail. Normally edge lines are off to save on rendering time.